Legislator Anker presents a proclamation to the Mount Sinai High School Ocean Bowl Team and the team’s coach, teacher David Chase. 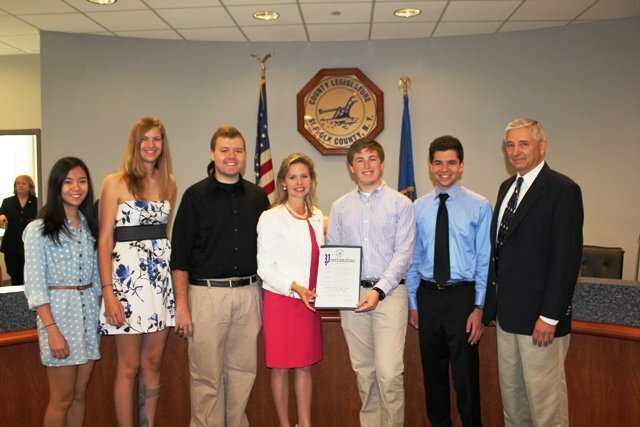 Riverhead, NY, June 2013 – On Tuesday, June 18th, Legislator Sarah Anker recognized the Mount Sinai High School Ocean Bowl team at the General Meeting of the Suffolk County Legislature. The team won the New York Regional Bay Scallop Bowl held on Feb. 16 at Stony Brook University. Mount Sinai High School was one of 16 teams that participated in the competition, which consisted of fast-paced questions and answers concerning the marine environment. The Bay Scallop Bowl is part of the National Ocean Sciences Bowl (NOSB), a program of the Consortium for Ocean Leadership based in Washington, D.C. For more information about the Bay Scallop Bowl, please visit http://www.nosb.org/competitions-2/regional-competition-map/new-york/. Subject: LongIsland.com - Your Name sent you Article details of "Legislator Anker Recognizes Mount Sinai High School Ocean Bowl Team"